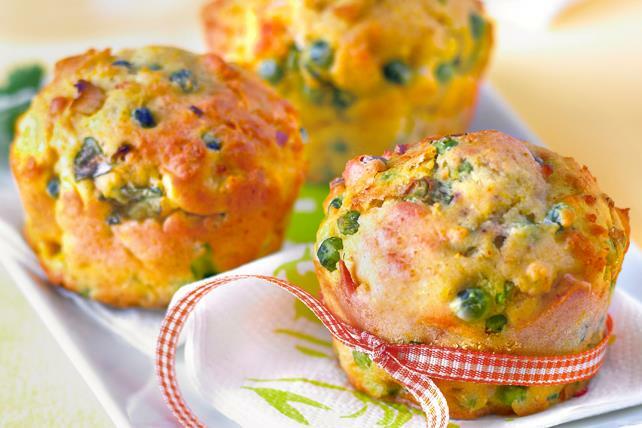 An easy-to-make egg recipe, these delicious Peas, Onion, Bacon and Egg Bites are made with peas, bacon, green onions and cheese. And since they're prepared in portion-controlled servings, they'll make the perfect addition to your next brunch table. Combine flour and baking powder. Beat eggs and mayonnaise in large bowl with mixer until blended. Add flour mixture; mix well. Add remaining ingredients; stir just until blended. Spoon evenly into 12 muffin pan cups sprayed with cooking spray. Bake 19 to 21 min. or until centres are set and tops are golden brown. These delicious egg bites are equally delicious whether served warm or chilled. For added convenience, this easy-to-make recipe can be prepared ahead of time. Cool, then freeze in freezer container up to 2 months. When ready to serve, thaw overnight in refrigerator, then reheat in 350°F oven 12 to 15 min. or until heated through.